February 9, 2010 – People will say in conversation that Louisiana never produces great DT’s or DE’s. I would say that is false, and that Louisiana has always had great players for Defensive line. You just have to take a shorter Defensive tackle like a Anthony Mcfarland (6-0 310), who went to LSU, and played in the Super Bowl with the Tampa Bay Buccaneers and Colts, or you have to work hard to find a raw tall kid who hasn’t filled out yet, like a Neil Smith (6-5 210), who came out of New Orleans years ago, but went to Nebraska and filled out to 260 and became a All American and NFL star. Most recently D Anthony Smith (6-1 290), who plays for La Tech, was signed out of Pickering, which is right outside Leesville, LA, 4 years ago and wasn’t even offered by LSU or any big time program, but will most probably get drafted in the first or second round of the upcoming draft. Smith will be one of the highest ranked tackles going in the NFL draft. He can run under a 5.0 flat forty, at 290 pounds. He has a chance to do under 4.9 at the NFL combine, that’s coming up. If you read my notes, this year’s group has several big time kids going to big time schools, and these kids have NFL potential. I will start off and tell you who would have been the top two most talented tackles in 2010 and would have played in 2010 for any college but grades need to be in order, and these two great players will start off at Junior Colleges. DT Nick Williams of Glen Oaks HS, 6-4 380, who can chase down running backs, side line to sideline, every play, and actually played both ways, has quick feet of a LB, and can be a Terrance Cody type player one day, but he will start off at a Junior College, at the moment, Fullerton, out of California, leads for his services. Nick was the best NFL prospect and upside line man coming out this year. Second would be a kid named Resien Brossard (6-2 285), who played at Lagrange HS, in Lake Charles. This kid will start off playing college football at the famous Hinds Junior College in Mississippi. Brossard started his high school playing days at Washington Marion in Lake Charles, but finished at Lagrange. Brossard has great feet, and can run sideline to sideline. This kid, like Williams, can name his school if he sticks to the plan of two years in a Junior College. I hope both of these kids stick it out because they have a future in the NFL if they do. Let’s take a look at the best Defensive tackles and Defensive Ends that I saw in person and on film, the last three years for this class. 1. Nic Jacobs – 6-5, 260 – Many – Nic Jacobs played Tight End and Defensive End for his high school. He’s listed as a TE for college, where he signed with LSU, but I feel like he’s the best player in the state any position and it’s so hard to find a player his size that can run and use his hands so well to not play him as a Defensive End in college. Nic would make a great TE because he has great hands and can run in the 4.7 range in the forty. I think he can even get faster in college with some hard work. This is a kid who can weigh in the 280 to 290 range and still run under a 4.9 forty, which to me again Defensive end off the edge with quickness and power, would be great for any school. Nic has long arms, and when used this year as a TE, he showed that his natural upper body strength is there already, where he blocked and pan caked many players in high school. What you might see, is this kid play some Tight End for LSU as a freshman, because they need a big talented blocker. However, like Marcus Spears who did the same thing, he will probably move to DE, I predict, by year two. Remember this name. This kid can be as good as he wants to be and it’s scary to see what Head Strength coach Tommy Moffit can do with this kid at LSU. Tommy is one of the best Strength coaches in the United States. 2. Ivan Robinson – 6-3, 265 – South Beauregard – This is a kid from a small town outside of Lake Charles, Louisiana, that can flat out play. I remember filming Robinson as a sophomore and he was super quick. He stood 6’3” and was 235 pounds at the time, while playing DE and some TE. Robinson is not a highly ranked recruit, but he is a big time football player. The reason he’s a big time football player is because he plays the game full tilt, loves the weight room, is smart, and most of all, he will become a better player in college, because in high school, he was double teamed and he did not have anybody to help him with any size for a pass rush. In college he will be a true DE and will not have to play Tight End. This kid could move inside and be 285, or he can stay 265, and be a super DE. I like his effort when I see him play. I can tell he needs more work in weight room to get stronger. Texas A&M got themselves one heck of a steal. 3. LaCraig Brown – 6-4, 275 – Richwood – I feel like one of the most under recruited schools for football players in Louisiana is Richwood High School. Richwood had a kid named Jimmy Young 4 years ago who played WR. He was 6-1, 190, sculptured, fast, ran a 4.45 forty, and a tough WR and no one recruited him hard except Texas Christian, which we all refer to as TCU. Young will be drafted high in the 2011 draft, and I feel like one day LaCraig Brown will be the same type of player. It doesn’t take a rocket scientist to see, that when you stand 6-4, and weigh 275, and make tackle after tackle, sideline to sideline, with long arms, that you are pretty good. Brown will have the luxury of playing either DT or DE, depending on where Arkansas needs him more and soonest. Brown can stay 275, and be a big time player off the edge, or bulk up and be a true DT, if needed could weigh 280 to 290 easy. I would love to see him left at Defensive End in the SEC, because he’s such an athlete at 275 pounds, and he’s tall, and looks like a NFL player in size and speed. Arkansas did it two years in a row. They came in and got DD Jones from Bastrop last year, who is 6-4, 300 pounds, and can run like NFL tackles, and now they have Brown from nearby Richwood. Half of their Defensive Line starting, I predict, will be from Monroe or Metro Monroe. 4. Lawrence Cayou – 6-4, 260 – McDonogh 35 – This is a kid that I put on lists for over two years and told many DI schools about. The whole recruiting process not one school offered this kid a scholarship until Texas Tech did the week before national signing day. I saw this kid practice two years ago, in person, and let me tell you, he has the body and raw ability to be a big time DIV player after a redshirt year. Cayou played some as a junior but did not play a lot as a sophomore. It just so happens he goes to a school where you wait your turn to play DT or DE, which is coached by one of the best Defensive Line High School Coaches in America, Frank Daggs. Cayou has long arms and is a lean good looking 260 pounds. When you are 6-4, and you look lean at 260, and can run, you are a big time DIV I player. He’s got the grades and he’s a steal because he did not start till his junior year and came on as a senior. Cayou will weigh about 280 or more, and could stay at DE in college because he’s still got room to grow because of his frame. This is a typical non star player that’s better than any star ranked kid in the state. He’s what you look for at the position anywhere in America. It’s hard to find kids with this upside playing this position for college football. It’s scary what this kid can do when he plays his third year of football in college. 5. Gavin Stansberry – 6-3, 240 – Franklin – I went to see Franklin play in 2007, and I saw this kid with long arms and super sick speed running down RB’s and WR’s in open field. Stansberry was a sophomore then. I remember seeing this kid run down on kickoffs at 6-3, 220 pounds and be the first one down, and make the tackle. See, not many kids that young and that big can do these things in HS. Junior year Stansberry played OT and DE for team, the whole game, because they were small on numbers. Stansberry has the arms of a kid 6-7 to 6-8, and he’s got a frame to grow into, which easily could be 280 pounds. His hand time might only be in the 4.8 forty range, but his game speed in pads is in the 4.6 range. Texas A&M has got themselves one heck of a football player. Texas A&M might have both their starting Defensive Ends being from Louisiana in 2 years or less. 6. 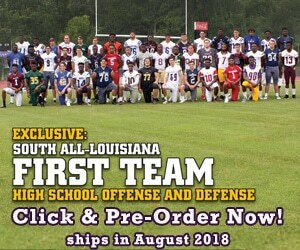 Trey Howard – 6-3, 240 – Ponchatoula – This is a kid in Tangi Parish who always looked the part for DIV football in the 2 years of seeing him start and three years of seeing him play. Howard is a big kid that can run, and you can tell when he wants too, he can make plays outside. Howard will probably start off his career at a Junior College or small school. This is a name to remember in 2 years because he’s just as good as the guys above, once he fills out. Howard has the frame to weigh 260 to 270 and play Defensive End in college. 7. Walker Ashburn – 6-2, 245 – John Curtis – This is a recruit, when you list forty times, speed, and size for the position, you throw it out the window. Ashburn is a football player and a leader. The past three years this kid was a dominant force rushing the passer, and he has a ton of sacks to show for it. He’s also a good tackler, and very smart. It seems he has a high football IQ, which some players don’t have. Ashburn is the kind of guy I would like to have on my defense, for effort, playing full speed, and leadership in the huddle. Bo Pellini, head coach from Nebraska, got a big time player from New Orleans. Bo likes physical tough guys, and he got his man. I look for Ashburn to stay at DE in college and either he will get down in weight or maybe, at the most, stay 260. In the Nebraska system, he could get down to 235 and play MLB linebacker. I think schools need true football players, and that’s what he is. 8. Houston Bates – 6-2, 230 – St. Paul’s – Bates was a pass rushing specialist in High School on the Northshore. Bates was second in the state in sacks as a junior and almost did it as a senior. The only concern was his size to play DE in college and his ability to play LB in college. His frame would be in the 240 range, tops, but I do remember a kid named David Pollack, from Georgia who played at 240 at GA and dominated SEC Offensive lines for three years. Bates has super quickness, and he mastered it on the field. Bates did not sign with any school on signing day, and what he might do is still up in the air. I hope he stays in state and still goes to LSU where he’ll prove everyone wrong about his size for the position. I think kid can flat out play. He was one of LSU’s first commitments this past year. 9. Jacoby Jones – 6-3, 240 – Mansfield – This kid amazed me when I went to see Chris Davenport play 3 three years ago (who signed with LSU last year and redshirted as a freshman from Mansfield HS). Jones played the Defensive line for Mansfield as a junior, without Chris, who missed most of the season with an injury. Jones was quick and gave super effort every play, and then would go back into the game and play OT for the team for 60 minutes. I was just impressed how he competed and gave great effort. I would have liked to see him play just defense. Jones did not sign anywhere for signing day that I’m aware of. I feel like for a DI school in state or IAA, he would make a great player for an in state school. 10. Jordan Arthur – 6-4, 260 – Carroll – We talked about Brown from Richwood, and this is the biggest sleeper in the state as a DE. Arthur started at 6-4, 230 pounds, on offensive line and defensive line when I filmed him. He was very quick and had the great frame you look for then. As a senior, he stood 6-4, and weighed 260 pounds, and he looked really good. He played a lot of Defensive Line also. Arthur hasn’t even scratched the ceiling for his potential for college. This is a kid, who in two years, you’re going to be hearing about him from NFL scouts while he’s at Jackson State. Arthur will be 270 to 280 pounds, without even trying with two more years to grow. 11. Everett Ellefsen – 6-4, 240 – Mandeville – How many kids do you know, who have no junior film, but mop up plays, starts his senior year, and becomes a big time recruit. It happens a lot. I saw this kid play as a backup in 2008, and I saw so much raw ability and upside. This kid did not start because he backed up a IAA signee, who was 6-6, 280 pounds. That’s how you don’t start as a junior. Everett has a laid back, yes sir/no sir personality. When he did play as a junior he impressed me with his effort, and even though he was raw, his foot speed was there to be a big time DE for college. This kid is a good looking lean 240 and he will easily weigh in the 265 to 270 range when he’s done. If needed, he could be on the two deep as a freshman, but he really could use a redshirt year to come back at 255 with good feet. It’s scary how good he will be with 15 more pounds. McNeese State has got them one heck of a diamond in the rough. Throw all ranking out of the window, this kid can play football. His dad is from Illinois originally. 12. Aaron Thibodeaux – 6-4, 240 – St. Fredrick’s – Aaron played at a small private school in Monroe that dressed under 35 players as a team. Most of these kids played both sides of the football. Thibodeaux played TE and DE for team. Aaron was the tallest and biggest kid overall on the team. This is another kid, when you look at forty times, and speed, you throw it out the window. He’s a football player. He plays hard, is mean, runs well, and makes plays. I’ve seen this kid block field goals, extra points, and rush the passer all day long. Aaron is also an ALL State baseball player. The ULL Ragin Cajuns have a big time home grown steal. It would not surprise me if this kid plays both sports at ULL and excels at both while in college. Aaron is still a thin, lean 240, so 250 to 260 is coming, and he might end up as a DT or OG, when it’s said and done. This kid has the frame for 280 pounds. 13. Justin Evans – 6-4, 220 – Haynesville – Ten years ago, this kid would have been an ALL American coming out of high school. The new standards for DIV I is sign them big and fast. Well this kid is tall, fast, and will be big. Peveto, and his staff at Northwestern State got a big time steal. This kid runs track and runs the relay for his track team. How many kids do you know that can run an 11.00, 100 meters at 6-4, 220 pounds? Justin has a brother, Demetric Evans, who made all SEC at Georgia in the SEC, and he still plays in the NFL for the San Fransisco 49ers. Justin, just like his brother, will weigh in the 260 range. It’s coming and he can run, which means remember his name. When you play at Haynesville, remember, the offensive line usually also plays the Defensive Line. Track keeps Justin’s weight down, otherwise he would already be in the 230 to 240 range. 1. Damien Jacobs – 6-4, 310 – H.L. Bourgeois – The most talented kid I saw play on film in 2008 was Jacobs for the Defensive Tackle position. Jacobs was in the 280 pound weight frame, when I saw him, he was super quick, and played extremely hard, going into his Senior season he was a little heavier, and did not look the same as his junior year, but I knew this kid had great feet, and so did Florida State, and Jimbo Fisher, who took this kid for the 2010 class. If Jacobs maintains his weight, and keeps getting better, he has a chance to be a NFL player one day. I saw some Dorsey like moves at times form this kid, when he was a junior. IM not saying he’s Glenn Dorsey, but he’s got the same type build, and plays low at times, and runs sideline to sideline very well, when he’s in the 280 to 285 pound range. 2. Kenny Welcome – 6-2, 275 – McDonogh 35 – This kid, did not play a lot as a junior, but his senior season, he looked like a big time DIV 1 player. Kenny is a big raw kid, who will be a great DIV 1 player inside. I will say this; Kenny is the best true impact DT from Louisiana that Tulane has signed in a long time. This kid is good enough to play at LSU, OLE MISS, Kentucky, and many others, and make an impact. Tulane needs this kid to come in and help right away. The day he hits campus, he might be the most talented true DT on the team. Kenny could weigh in the NFL size 290 to 300 pounds in two years. He will probably play in the 280 range as a true freshman, which is a jump up for Tulane, who’s use to converting DE”S, who are undersized to play DT. I love this kids upside, and happy for Tulane and coach Toldeo for getting this kid in the end. Many DIV I schools tried to get him to de commit from Tulane, and I admire the kid for remaining loyal to the Green Wave. 3. Elliot Scott – 6-0, 295 – Denham Springs – This kid is the perfect noseguard for any level of football. Scoot is good enough to play for LSU or any major power. Elliot might have to start off at a small school or Junior College. Scott has amazing super quick feet for a big guy. Sometimes, when you see this kid chase Running Backs, you just marvel how gifted he is. Remember this name because in two years, he can be a National Signee, and one day get a shot in the NFL. If a small school is smart they will sign this kid, and in two years be a great starter. 4. Clayton Sylve – 6-1, 283 – Belle Chasse – Everybody knows, that teammate James Wright WR and LSU signee is a super player, but what I don’t understand, and I don’t get, is why all IAA schools, and DIV 1 schools in Louisiana, not notice this, super quick DIV 1 player. Sylve was as quick and active as any DT I saw in the state. I feel like he’s better than most starting Nosegards in the SEC. I spoke to his HS coach the other day Bob Becnel, and where both amazed how no one saw, what where seeing on film or in person. I’m clueless with this one. Kid has really good grades, and would be an ALL American in IAA football. This kid is a football player, and I love watching him play sideline to sideline, play after play. 5. Brandon Jackson – 6-4, 275 – Evangel Christian – I know everyone in recruiting lists Brandon, as a Defensive End for college, but I don’t see that. I see Brandon bulking up and being a True Defensive tackle. What I like about Brandon is he’s a super smart player, and leader. He’s not explosive for the outside, and that will make the change to DT for Texas A&M, who signed him. Brandon might be one of the most mature young men I’ve ever talked to in person. IF Brandon gets stronger he will be a really good player for Texas A&M. Redshirt year would do Brandon good, to make the switch to DT. 6. Deangelo Brooks – 6-0, 285 – Airline – This is a name I’m putting here to remember in two years, if he goes Junior College, or if he chooses to go D2 or D3 or IAA. Brooks was the most explosive DT I saw in Shreveport this past year. This kid is so talented he lined up as a RB or FB, in the offense, and crushed people. Brooks runs extremely well, when the ball is snapped, he plays low, and makes a bunch of plays. Brooks would make a really good DIV 1 DT or Nose in college, again depending on what the kid chooses to do. I would like to see him go the two year route Junior College, and be a high ranked recruit in two years. Brooks has a younger brother who’s built similar, and also plays Defensive Line, and returns in 2011. Previous: What Happened to Tulane?